There are many famous and not so famous water bodies in Kasi. The Kurukshetra Pond lies somewhere in the middle of the range. 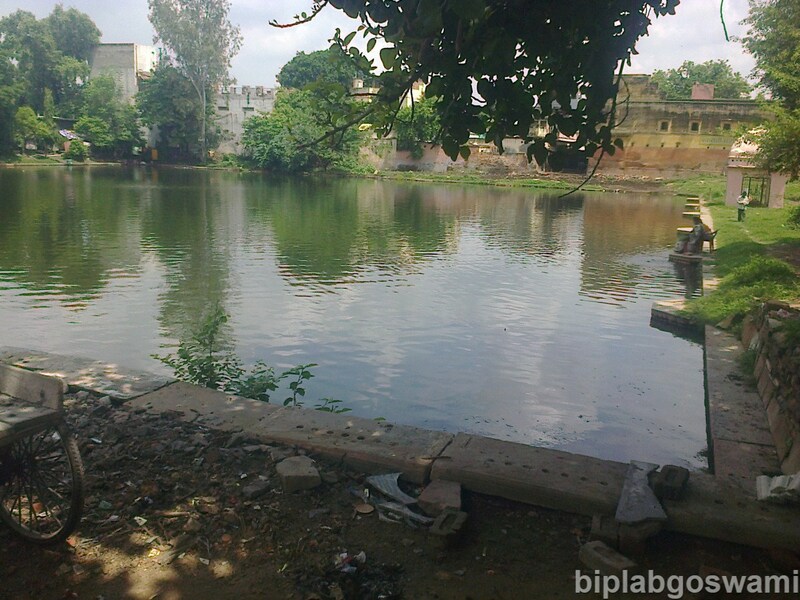 It is nearly mid-way between Gangaji and one of the most famous ponds of Kasi: Durga Kund. Before we go any further, I must share the knowledge of the etymology of pond words that my friend Biplab had called the other day to tell me. Kund or pokhra is a natural water body, whereas, talab is man made. Kurukshetra is a pokhra. One look of the pond is sufficient to tell that there has not been any important activity going around. The area around the pond is not paved with stones, as is the case of the important Durga and Lolark kunds. Due its unfavourable location, this pond was overshadowed by the two neighbouring water bodies. I have not heard of any mela being organized, keeping this pond in the centre, as is the case with Durga, Lolark, Krim, Laxmi etc. kunds. Professor Eck’s magnificent book had taught me the formation of the cyclical water flow through the various internal water bodies of Kasi. She had explained so vividly and simply the flow of water from Matsyodari Lake to Gangaji, through various other water bodies. I can apply a similar logic over Assi area. Normally, after an adequate monsoon rainfall, the whole Nawabganj area and its pond would empty their water in Durga Kund and the overflowing Durga Kund would flow up to Kurukshetra Pond. From there the overflowing stream would run to Gangaji. When the river herself was in flood and was overflowing, breaking bounds, it would push Assi stream backwards and flow that way. I have seen this happening several times. What I have never seen is Assi stream’s overflowing and taking a right turn to meet the water of Durga Kund, and then flowing downwards to meet Gangaji. In the past, I am sure that in the absence of any kind of man made obstruction that used to happen in the years of high floods.